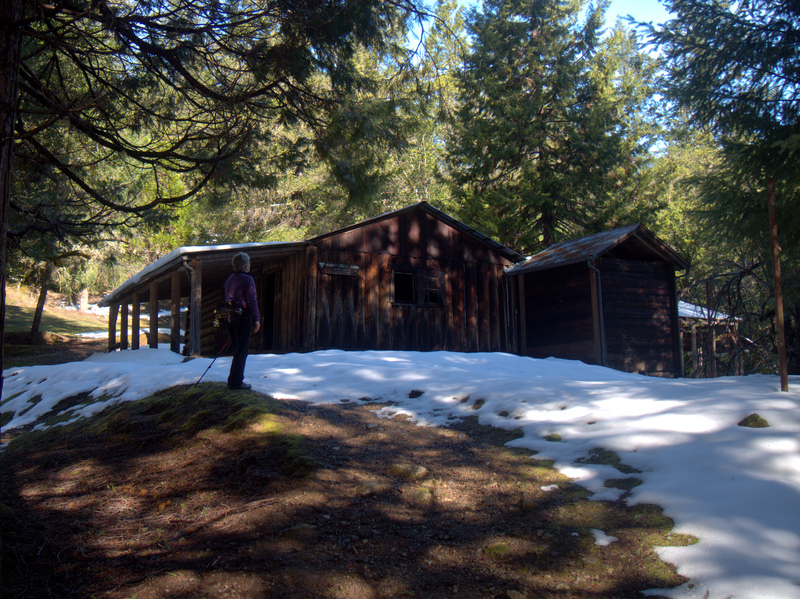 Whisky Creek Cabin is the oldest known still standing mining cabin in the remote lower Rogue River canyon. 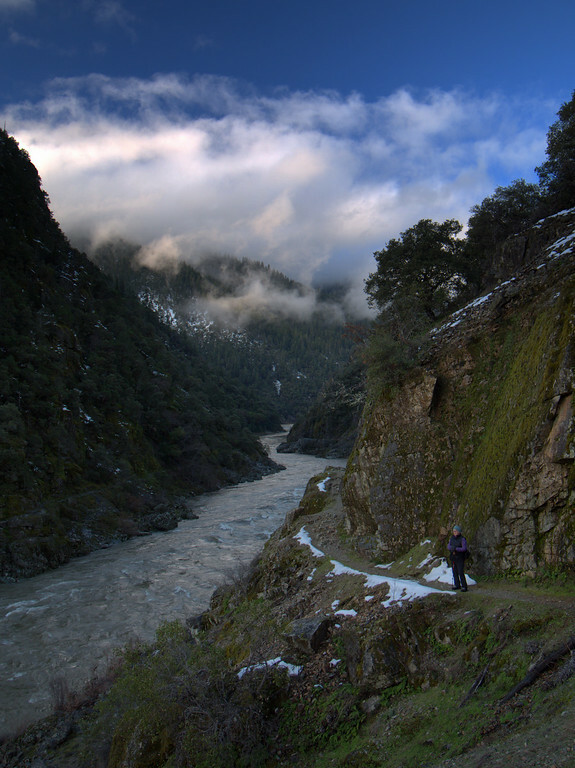 It sits just above the iconic Rogue River Trail (BLM, USFS, Our Trip) about 3.5 miles downstream of the put-in at Grave Creek. 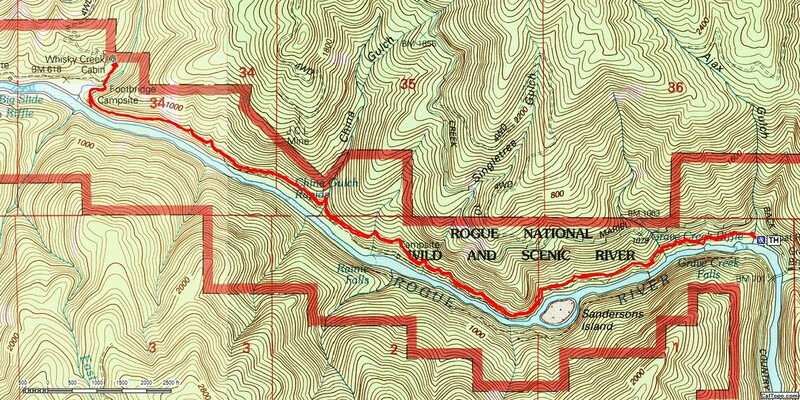 It makes a great goal for a moderate and educational dayhike in all but the summer months, when it can be brutally hot in the canyon. 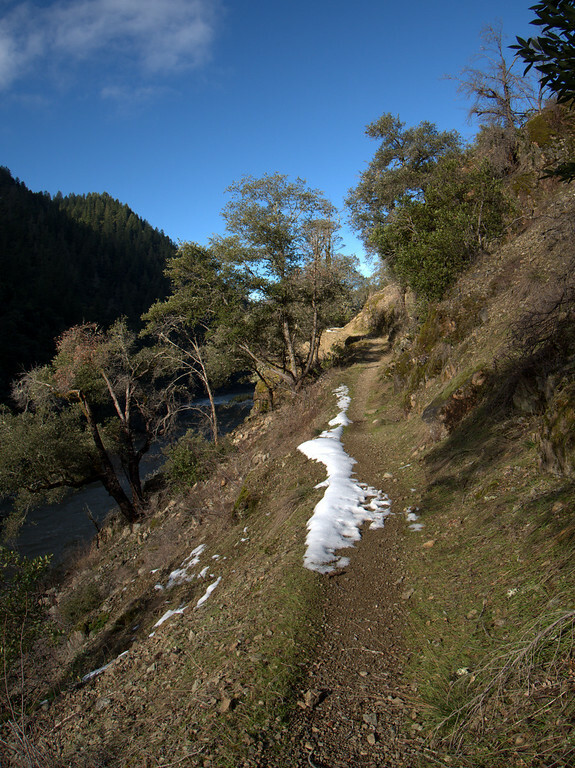 With the remnants of the Great Storm of 2017 (now referred to locally as the “Big Dump”) still stifling access to higher elevations, we figured, based on a previous hike there (post), that the Rogue River Trail, which is south-facing and at an elevation of only 600 feet, would allow us to do a snow-free out-and-back hike to the cabin. 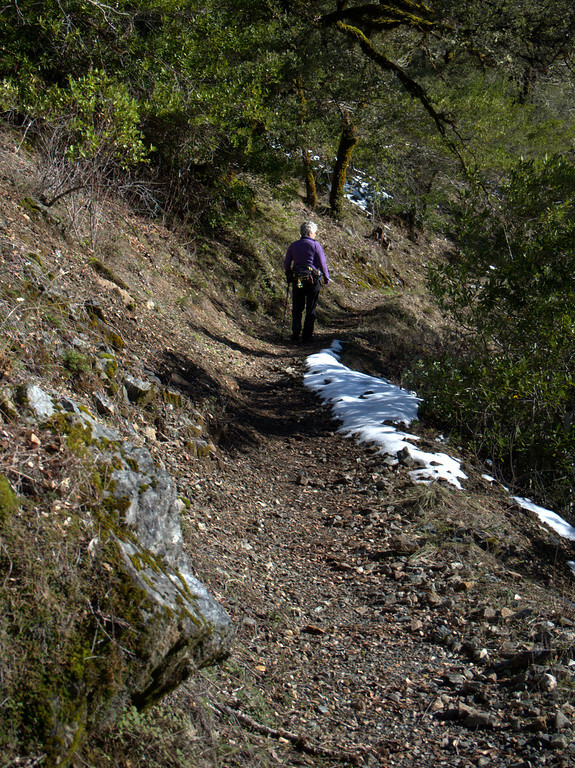 The drive over to the trailhead was on roads disconcertingly lined with a foot or more of snow but when we got to Grave Creek, we found it and the trail almost entirely clear of snow! 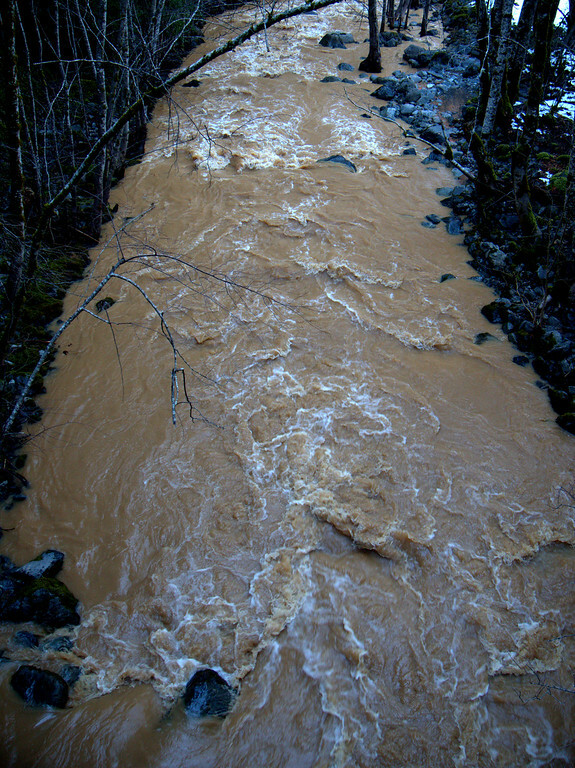 The added bonus for hiking at this time of year was a chance to see the Rogue at high water – it had come down some since being in flood just two days ago but was still impressively high. 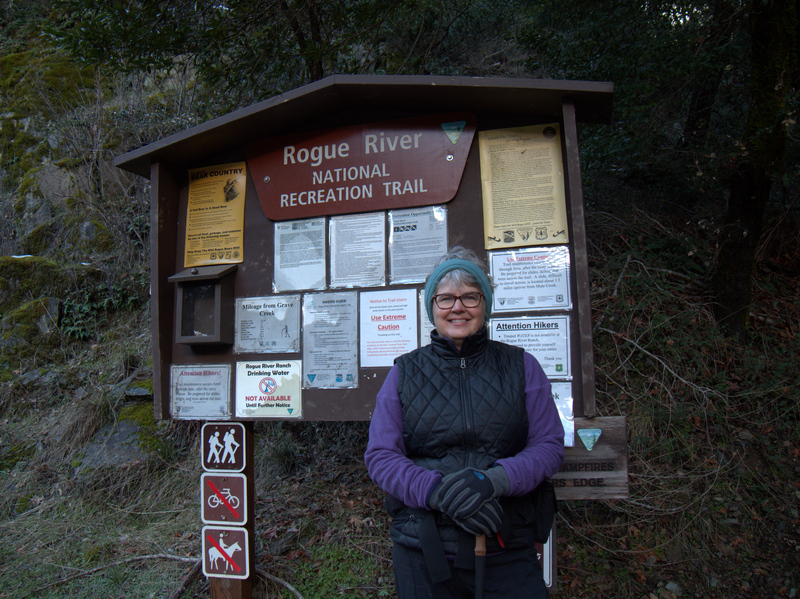 After we’d parked and gotten organized, the LovedOne put on her extra layers and her brave hiker smile and we were off westward on the Rogue River Trail. 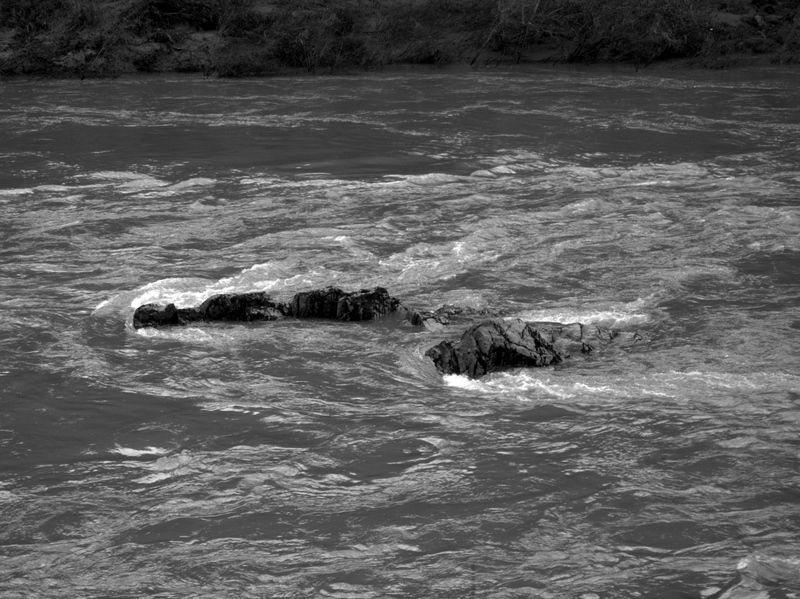 and also of the river roaring off downstream. 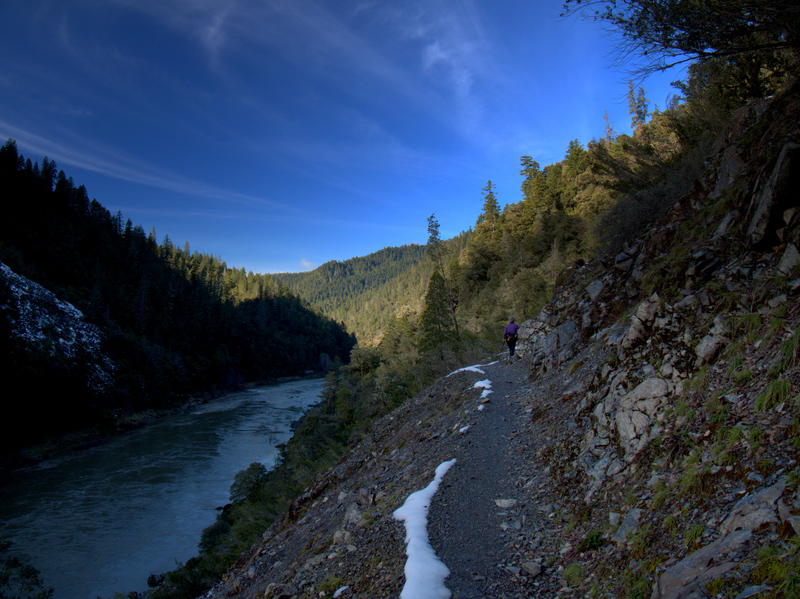 The Rogue River Trail, beyond being spectacularly scenic, is one of the easiest and most straight-forward trails in Southern Oregon, one that presents few, if any, meaningful risks to hikers and backpackers. 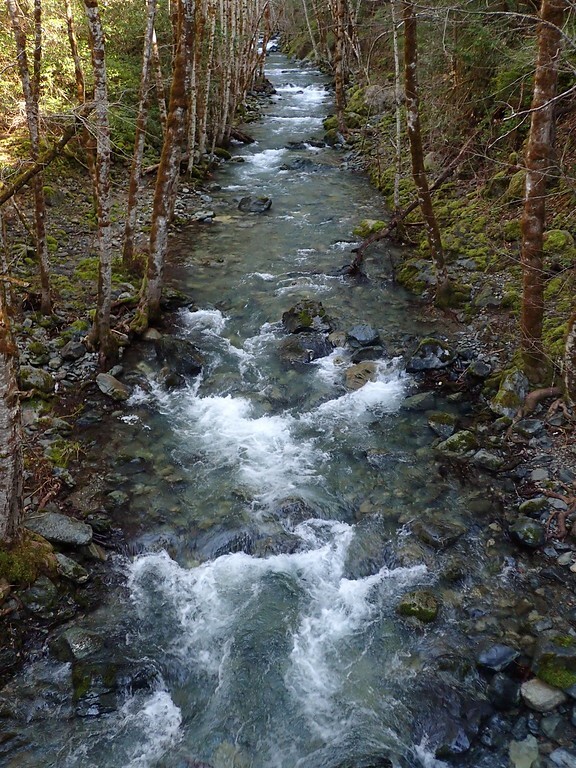 But during the wet season – particularly this wet season – some of the side creeks (which are usually quite diminished by April) can be pretty energetic. 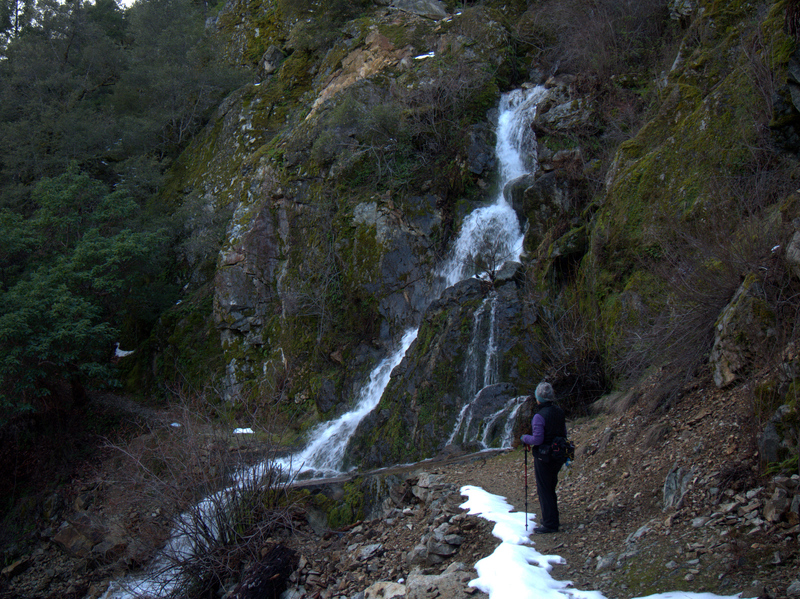 Shortly after leaving the trailhead, we came to the most impressive of these, now pouring at high volume over a slick, downward sloping piece of trail. 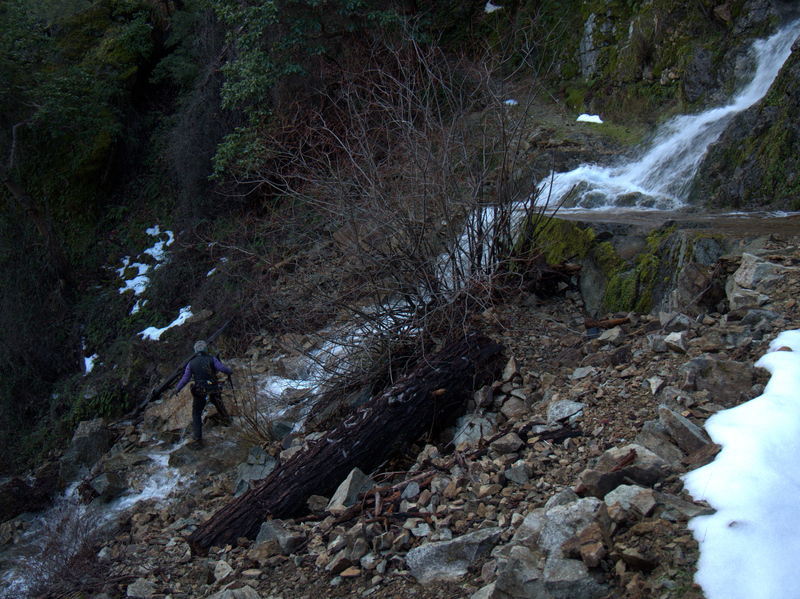 Fortunately, conditions weren’t icy, so it was not hard to (carefully) climb down and around it. and past a fern garden, now lushened-up by the moist weather. How these little moisture-loving plants survive the burning summers in this canyon is a bit of a mystery – or at least speaks well for the ecology of adaptation. 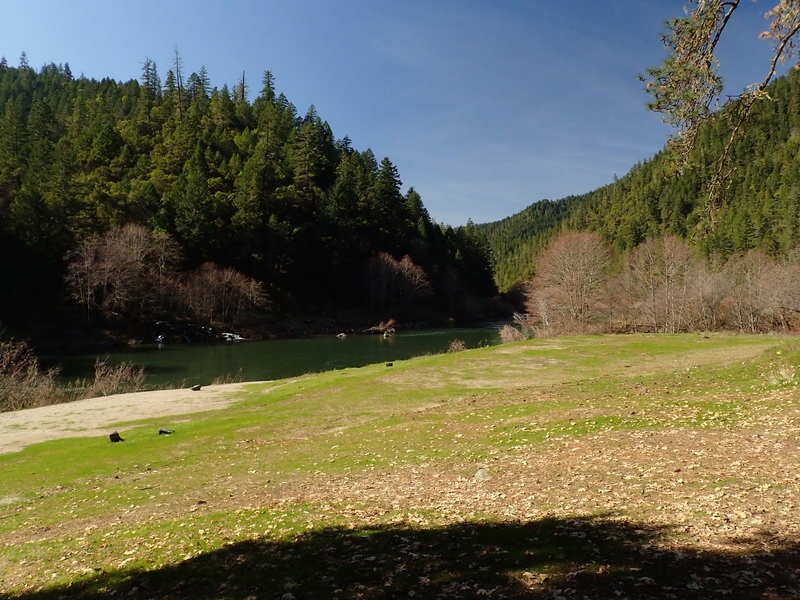 A mile down from the trailhead, we passed Sandersons Island, a large gravel bar in the middle of the river. 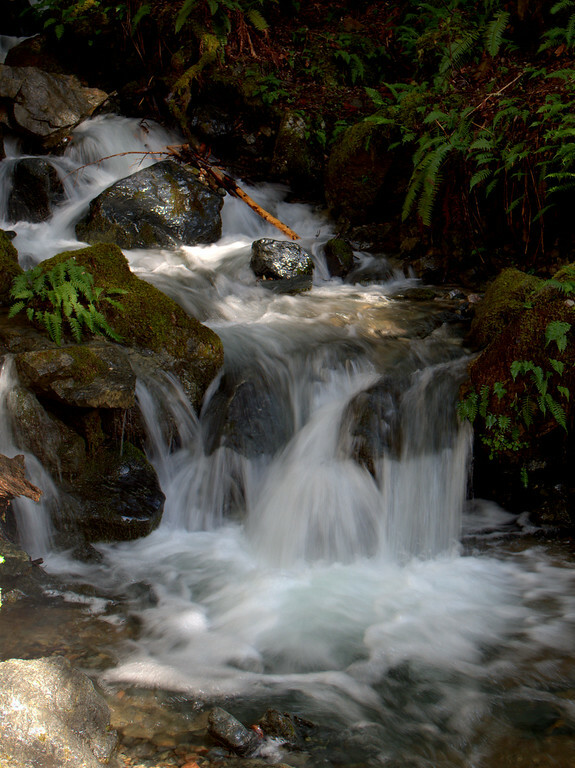 It was named for the Sanderson brothers who mined in this area from about 1900 to 1940. Just past the west end of the island are old concrete piers from the pack mule and foot bridge across the river that the Sanderson’s built and operated from 1907 to 1927. 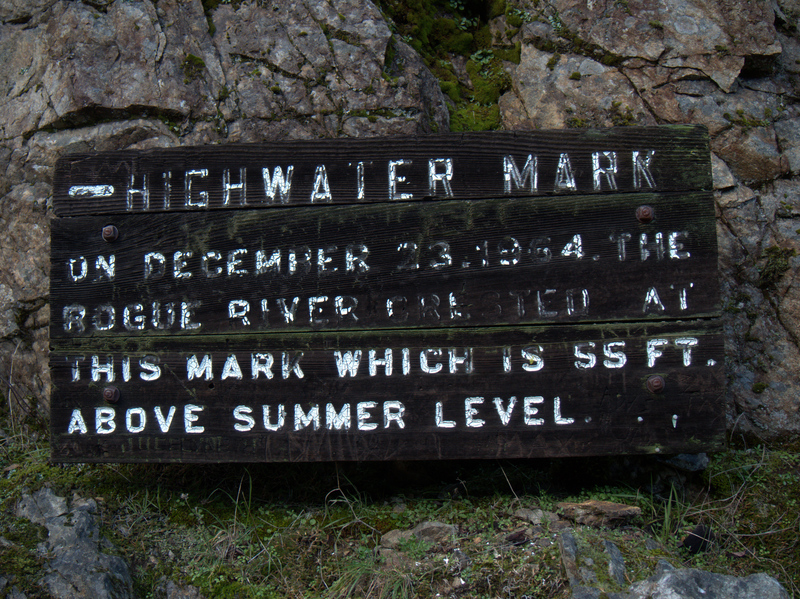 The bridge was destroyed by the 1927 flood and the 1964 flood crested here 55 feet above the summer water level (there’s a plaque marking the spot). 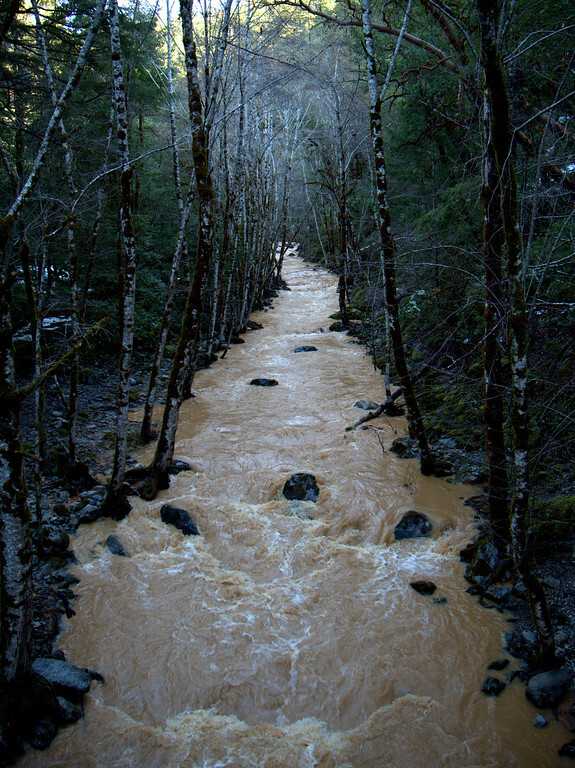 These events say something about how powerful this river was before flood control dams were built upstream. 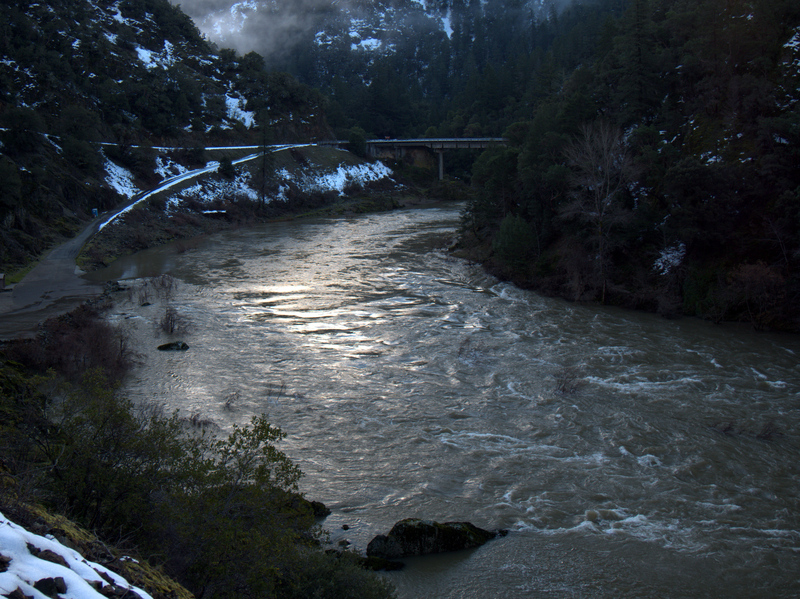 Even with the dams, the Rogue is still capable of rising 20 to 30 feet during winter storms. 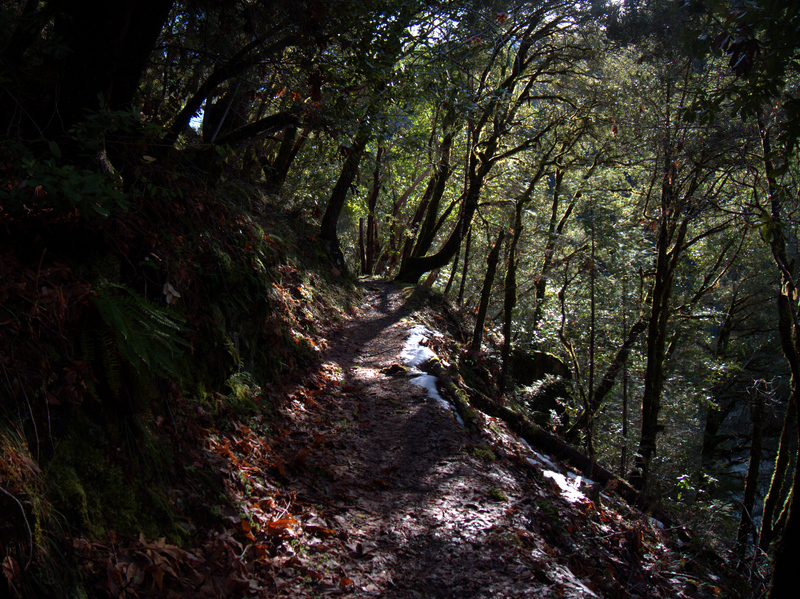 We continued along the trail, now enjoying sunshine as the sun had crested the lip of the canyon. but which required only a few artful steps to get past. 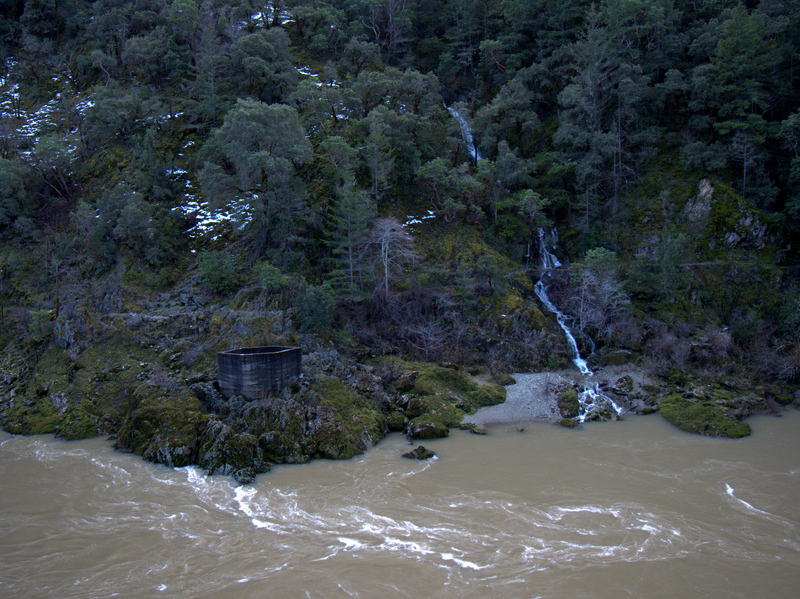 We soon passed Rainie Falls, a 15 to 20 foot high falls that rafts get around via a fish ladder. 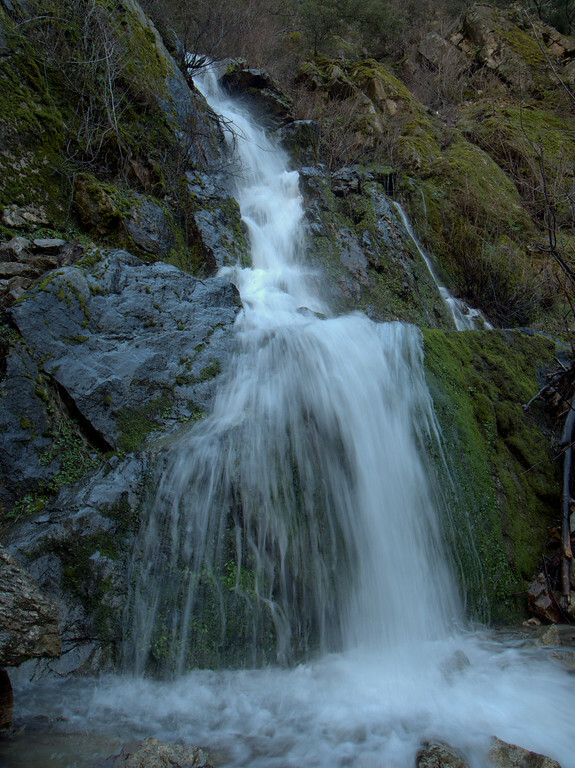 The falls were named after old man Rainie who lived in a small cabin below the falls and made a living by gaffing salmon. 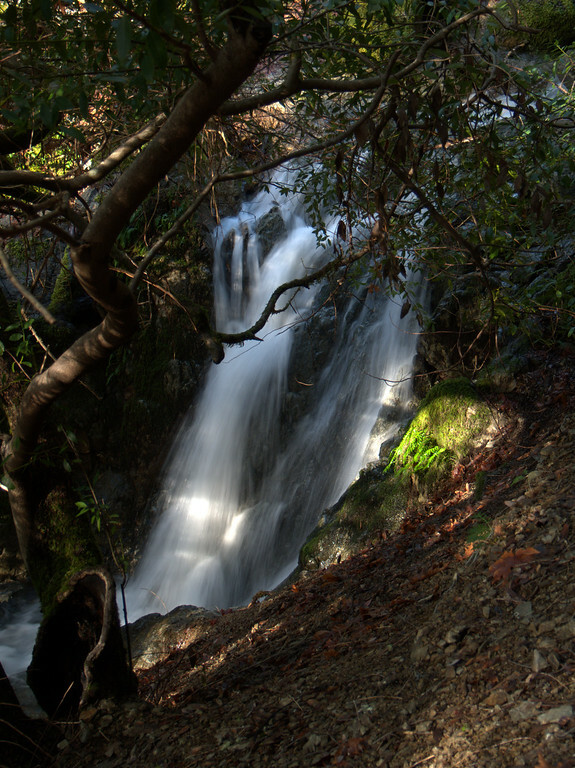 Today these falls were almost completely submerged by the high water. 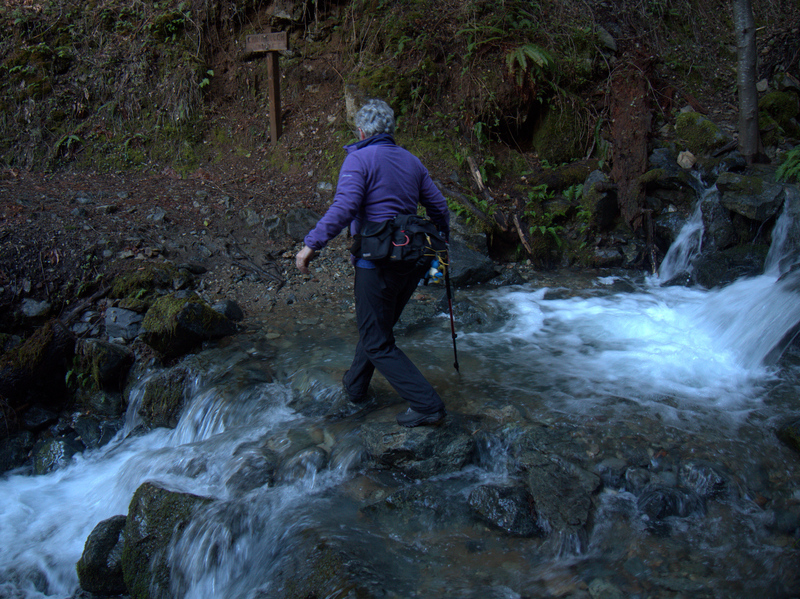 At about two miles from the trailhead, we crossed China Gulch with yet more graceful steps. 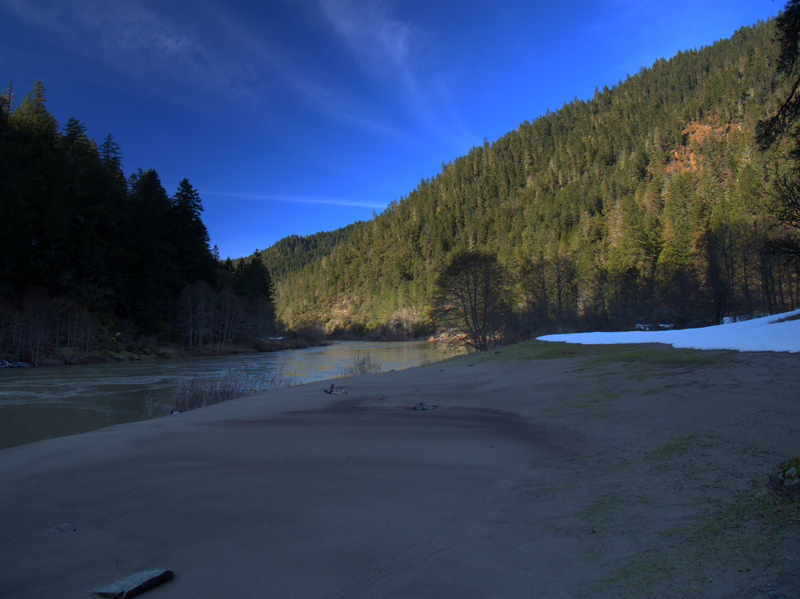 we reached Whisky Creek, where the beach at the campsite there had just been scoured flat and clean by the recent flood waters. a vastly different look from the crystal clear, blue-green waters it sports during the dry season. The cabin was its usual charming self, now set off by a ring of snow. 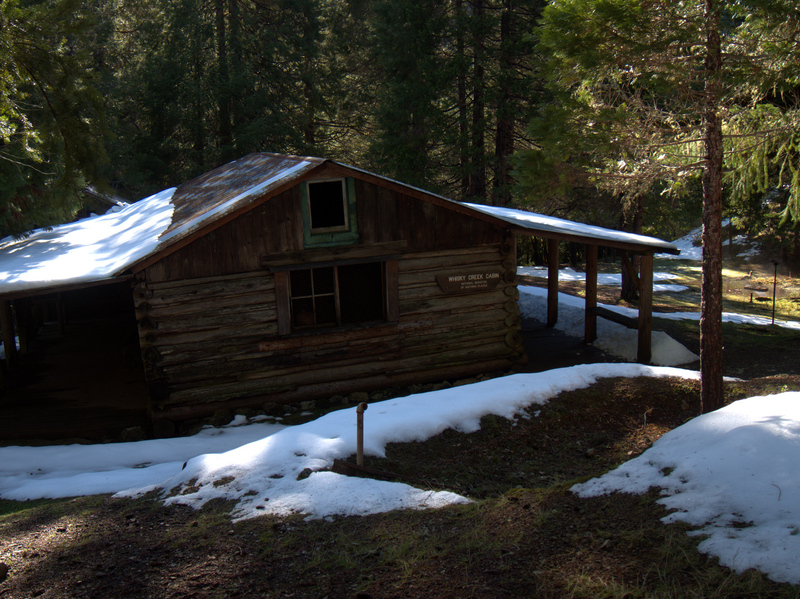 This cabin was built by a placer miner around 1880 and was last lived in (1957 to 1973) by Lou Reuben Martin. 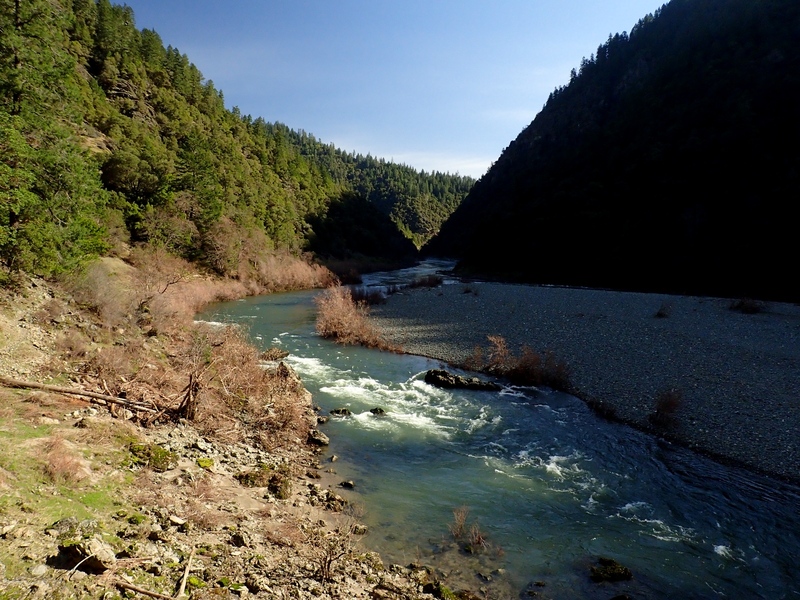 The cabin is on the National Register of Historic Places, and offers a glimpse into the pioneer history of the Rogue River. This time, we only had to carry out a couple of empty beer bottles left by droolers who can’t tell an historic place from a trash can! 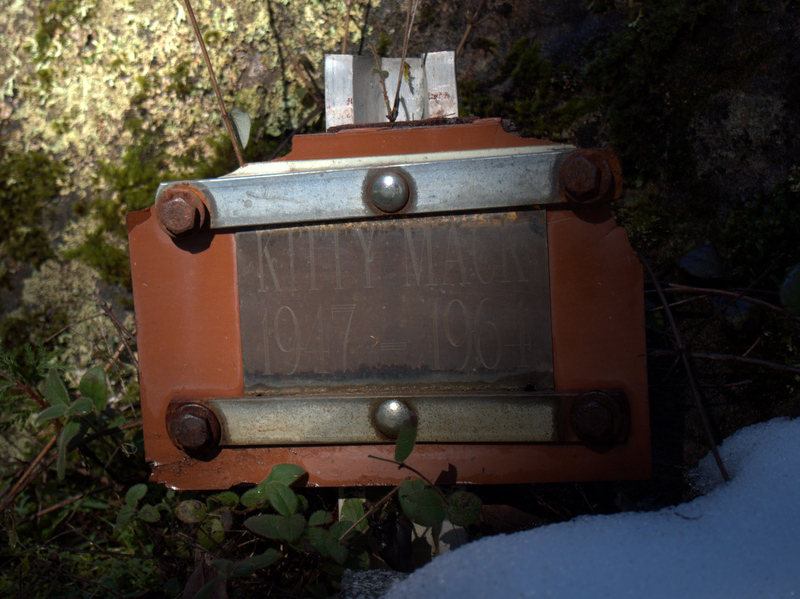 You have to read the information boards at the cabin pretty closely to discover that this is the grave of Kitty Mack (1947 to 1964) – Lou’s beloved cat and one with a severe fondness for fish (which were fortunately readily available in the nearby Rogue River). There’s something very poignant about this little resting place. 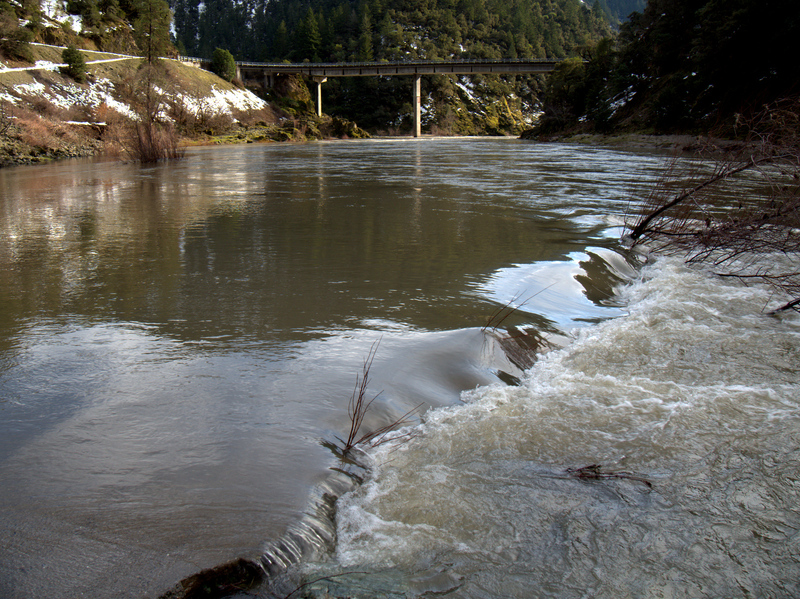 When we got back to the trailhead, it was fun to see that the river was still up over the boat ramp. 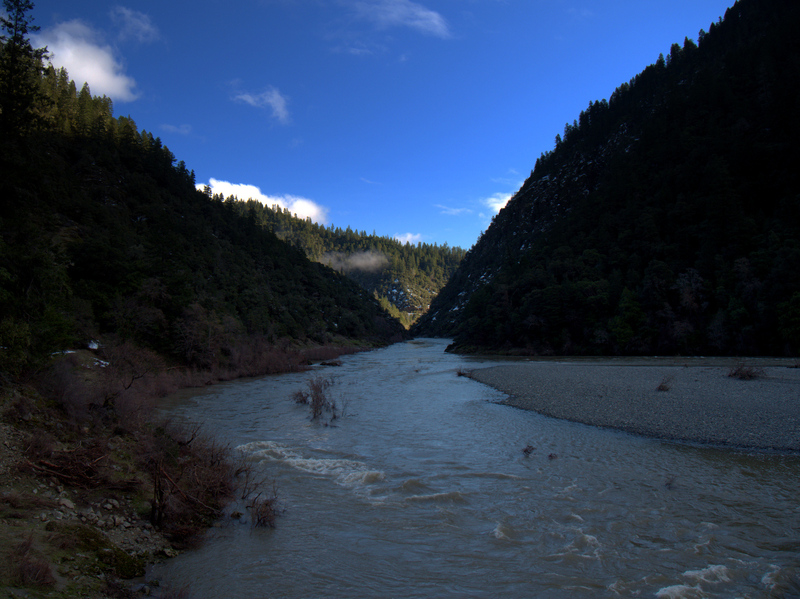 By the start of the summer rafting season, the waters will be at least 10 feet lower. 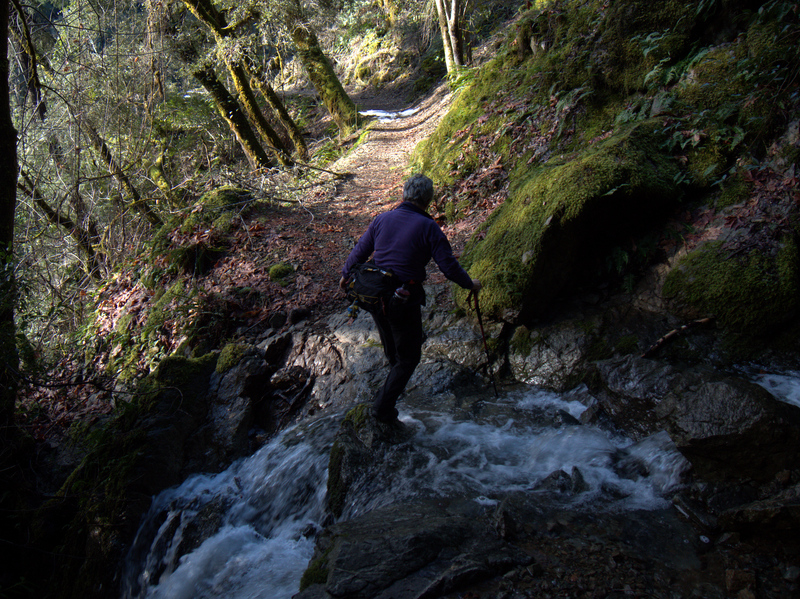 It turned out to be a perfect day (clear, sunny, but crisp) for this easy hike (7 miles round-trip; 300 feet of elevation gain) along the Rogue to the cabin, one that gave us an opportunity to see the river on high and some of the usually dry (or much diminished) side creeks in full flow. 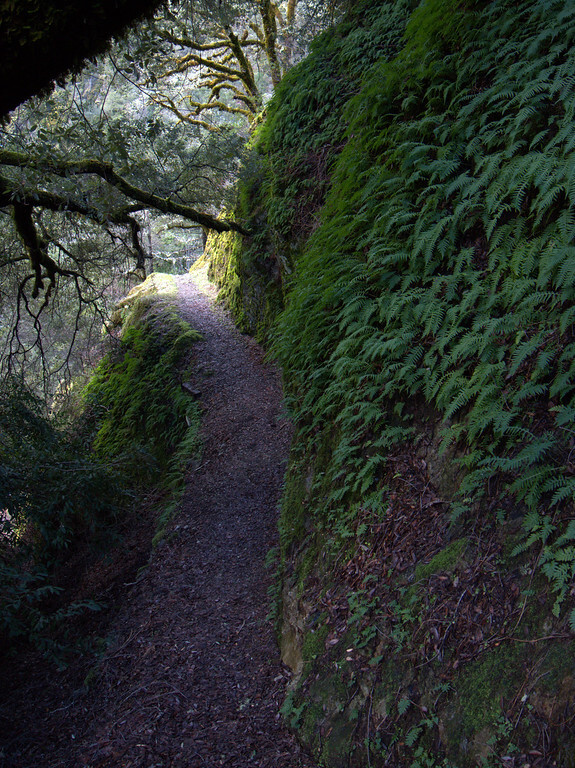 One of the classic hikes in this area (or anywhere for that matter) and one that is especially great during the Spring wildflower season. What a hike! You must have started your hike early because it looks like the sun was just peeking up over the mountains as you were on the trail. I love the photos, even in the low light they came out brilliantly. I can’t wait to see where you go next! Thanks! 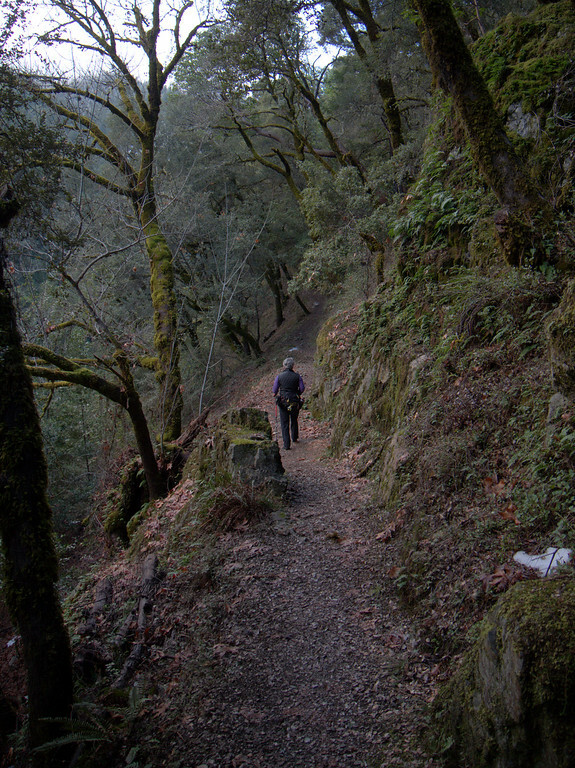 We left the trailhead at 9:15am but this part of the canyon is narrow and deep, so the sun only stays above the ridge for 2 hours or so at this time of year.